This book explores the cultural history of embryology in Tibet, in culture, religion, art and literature, and what this reveals about its medicine and religion. Filling a significant gap in the literature this is the first in-depth exploration of Tibetan medical history in the English language. It reveals the prevalence of descriptions of the development of the human body – from conception to birth – found in all forms of Tibetan religious literature, as well as in medical texts and in art. 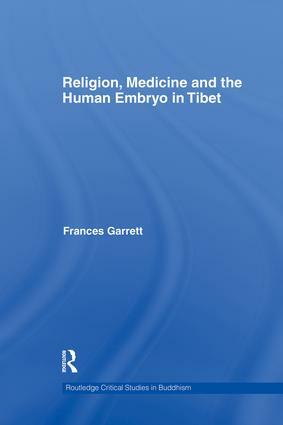 By analysing stories of embryology, Frances Garrett explores questions of cultural transmission and adaptation: How did Tibetan writers adapt ideas inherited from India and China for their own purposes? What original views did they develop on the body, on gender, on creation, and on life itself? The transformations of embryological narratives over several centuries illuminate key turning points in Tibetan medical history, and its relationship with religious doctrine and practice. Embryology was a site for both religious and medical theorists to contemplate profound questions of being and becoming, where topics such as pharmacology and nosology were left to shape secular medicine. The author argues that, in terms of religion, stories of human development comment on embodiment, gender, socio-political hierarchy, religious ontology, and spiritual progress. Through the lens of embryology, this book examines how these concerns shift as Tibetan history moves through the formative 'renaissance' period of the twelfth through to the seventeenth centuries.